1) Memorial Day is an American holiday, observed on the last Monday of May, honoring the men and women who died while serving in the U.S. military. 2)Originally known as Decoration Day, it originated in the years following the Civil War and became an official federal holiday in 1971. Many Americans observe Memorial Day by visiting cemeteries or memorials, holding family gatherings and participating in parades. 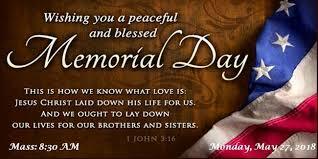 3)Each year on Memorial Day a national moment of remembrance takes place at 3:00 p.m. local time. 4)In 1966 the federal government declared Waterloo, New York, the official birthplace of Memorial Day. 5) On May 5, 1868, General John A. Logan, leader of an organization for Northern Civil War veterans, called for a nationwide day of remembrance later that month.